Figure out what went wrong and don’t do it again. When there is a problem with work or with your personal or professional life, there is usually more than one issue involved–and all of the issues need to be identified and dealt with, if you want to move forward and make things better. They may not all be your fault, but you nearly always can change some aspect of your actions or reactions. What’s your problem? Look at a current issue with which you’re grappling–you know, the one that you’re having so much trouble with and it seems as though you just can’t make it better. Take the time to list all of the elements of it, not only the essence of it. What contributes to the overall problem? By eliminating one issue, then another, then improving something else, you will often find that the HUGE problem was actually six or eight other issues that were working against you. You could have never eliminated the big problem as long as the other problems were present. Who are people who have the most effect on this situation? Even if you feel you are mostly responsible, see if there are one or two people who may purposely or inadvertently add to the situation or make it difficult for you to stick to your life or work plans. What do you need to do differently about your relationships or interactions with them? What is the Instead factor? Anytime there is a problem there is an instead. What are you stuck doing instead of the thing you need to do or want to do? What is happening instead of the positive things that need to be happening? What are the results instead of the results that are wanted or required? When you need to get something accomplished, what situation presents a barrier–and what would be better instead? If you track back, where did it start to go wrong? When you are thinking about something that exists now, thing about how it got that way. It may be so many years ago that it’s hard to figure it out, but it’s an interesting exercise. You can’t change the past but you can keep from repeating it an hour from now. Or, at least you can start to change long-term habits or improve a process or activity that has failure designed into it. Think change instead of blame. When you have a situation that is dragging you down, wearing you out or driving you crazy, it’s a temptation to quickly assign blame–to someone else, to yourself or to a giant conspiracy of factors. Take blame out of it and instead think change. What needs to change? Even if the situation is primarily caused by others, what do you need to change about your actions or reactions? It may be time to speak up, take over, get out or do something else instead of what you are doing now. The Edsel Problem: Many studies have been done about what went wrong with Ford’s Edsel in 1957. Actually, nothing went wrong with the Edsel. But dozens of things went wrong with the processes, programs and plans leading up to it and while it was being produced and marketed. The poor Edsel just got the blame for all of those failures. 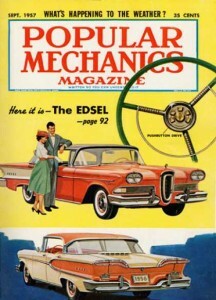 Even then, had Ford fixed some of those peripheral problems the Edsel design could have been a success, even if the actual model and name had been phased out. But, when it seemed the car was failing, the easiest solution was to stop making it–which completed it’s downfall in auto manufacturing history. People quit, so the Edsel failed. Right now you are probably dealing with several long-term problems. Mixed in with those will be short-term issues and a few brief crises points. Look at each of them as having several elements. Do something about the elements and see if that doesn’t help you with the essence of the problem. You might be forced to do something quickly to avert disaster now, but take the time to figure out all the things that contributed to it and deal with those. Otherwise, you’ll be dealing with the same problem again, real soon! You have to be a psychic! I can’t even begin to tell you how this fits me right now. I just tracked back on something and it’s really an eye opener. Thanks! D.
Excellent advice! In my counseling work I have found exactly what you describe. Someone comes in with “THE” problem. After we talk about it they realize there are several other things that are problems too and they all come together to create another one. I especially like the idea of the Instead Factor. Very applicable to personal problem solving. Greetings, Tina. The Edsel story is a good one for this article. I did a large paper about it for a marketing class and showed essentially what you have said here. There were twenty or more organizational and people problems that came together. Ford figured out what went wrong and didn’t do it again, at least not in the same way. You drew an interesting lesson from the situation and I like the ideas for finding out the contributing problems. Thanks! I’m like Denise…I needed this for dealing with a particular problem that keeps cropping up in my personal life. I’ve heard the poem before and I liked your suggested line! Funny but true! P.
One of these days maybe we’ll talk about being a Saturn….a good product that was also selling well, but the powers that be STILL dumped it. Hello, Ms. Rowe. First, I’ve enjoyed looking at your website and think it is very interesting and inspiring. Second, at a Brotherhood Mutual Insurance conference they talked about your church security material and gave this website address. I would love to have anything of that nature, since we are working on a complete security plan. Could I also get the PDF file on challenging employees? I manage twenty employees and two of them are creating problems for everyone else. I’ve tried counseling, coaching and correcting but things haven’t gotten better. Anything you have on that topic would be appreciated. Thank you very much for sharing your information. Tina says: Thanks to all of you for your comments. I’ve responded to each of you by email. Terrance, thank you for the contact. I’ve heard from several people who attended the conference or training. The company sounds like an excellent resource. I’ll send the material for both church security and dealing with challenging employees. Love the suggested line! Insightful as always. What you shall be in a few months or years, you are becoming right now.